The aim of modern poultries is to attain efficiency and productivity that will turn out the highest profit. However, this comes with a total disregard for the chickens’ quality of life. They are raised in narrow cages under artificial lighting and heating, not to mention fed with chemicals and medicines. They are seen as mere tools of production and profit, not as living things to respect. While Natural Farming might also aim for efficiency, productivity and profit, it returns to chickens their right to a better life and provides them the opportunity to develop their natural potentials. In Natural Farming, chickens are raised with all their needs in mind. They are provided houses with space and natural heating, fresh water, and natural feeds. In addition, the housing design dispenses with cleaning and wastewater, no chemicals are used and little labour is required. This is the Natural Farming approach to poultry management. The poultry will provide food for people and manure to condition the soil for the crops. In return, agricultural by- products can be used as chicken feed. In this manner humans, animals and crops will become inter-dependent. To foster harmony among family members. A family working together to take care of the chickens and do other tasks will form a close relationship. To rehabilitate the surrounding environment. NF poultry will enrich the land, put healthier food on the table and boost the local economy. The floor of the chicken housing should be soil, not concrete. Separating the chickens from the soil can cause disease. Temperature should not be artificially controlled. Heat from fermenting compost will suffice, even for small chicks, eliminating the need for heating machines. Feed for hatching's should consist of whole brown rice grains and bamboo leaves to strengthen the intestines. The NF chicken housing is designed in such a way that there is no bad smell, no emission, no cleaning needed, and no disease. The houses are constructed to suit the habits, instincts, and behaviors of the residents (chickens). Illustrations for constructing the various housing parts are shown in the picture. Made of galvanized zinc sheets. As the sun moves, it shines on another part of the floor, which enables the whole floor to receive some sun and get disinfected. Disperses the heat conducted by the metal roof. The continues passage of warm air and cool air into the interior takes away moisture from the floor and thus controls dampness. The walls have curtains to control air flow. The air convection allowed by the open walls provides an ideal moisture level for microorganisms to grow. FPJ, LAB and IMO – is added to the mixture for soil floor, enzymes from straw carpet and chicken feces. During certain times of the year, the floor may dry up easily, which requires water to be sprayed at least 1-2 times a week. It is vital to maintain a host of microorganisms on the floor in order to break down chicken feces. This contributes to the absence of smell in the chicken house. The feces do not need to be removed unless needed for compost. The chickens feed on the fermented products of their feces, so taking out all the feces may affect the chickens negatively. The floor serves as feed producer, fertilizer factory, and waste treatment plant all in one. Made of PVC drilled with holes. One chicken per hole to prevent fighting. The size of the hole and pipe is increased as the chickens grow. The hole is drilled such that it is slightly tilted back from the chicken’s position. Designed to wipe the chicken’s beak as it lifts its head to prevent water from dripping onto its chest as this can get the chicken sick. Water should always flow in the pipe to ensure that the water available is always fresh. The chickens are provided with perches for resting. Slightly arched in shape – sloping slightly, higher at the center. Prevents chickens from bumping into each other. Placed in the area between the perches and water. To provide room for movement the design is shown in the picture. With bright lighting at first and then gradually darkened, so that the hens will not get frightened. Chicks are grown in the brooding boxes, which also serves as an exercise and play area. In front of the box is the chicks’ playground, which is gradually enlarged as they grow. The brooding box is divided into Rooms A, B and C.
Room A is hot, where chicks rest. Room B is warm and serves as the feeding area. Chicks drink water in Room C.
The distance from Room A to C is 710 cm for mediumsized chicks. To compel chicks to run back and forth 50-60 times a day. A cloth curtain resembling a mother hen’s feathers is draped between Rooms B and C.
To make chicks feel cared for by their mother. Artificial heating is not provided in Natural Farming even if temperatures drop below zero. Chicks develop short, dense hair and resistance when exposed more often to cold. Under artificial heating, they will grow long hair and weak resistance. When exposed to cold, these weaker chicks will gather in a corner, increasing chances of getting crushed to death. In colder regions, heat from fermenting compost can be used. The compost is situated below the brooding box. NF emphasizes the use of homemade chicken feed. More importantly however, the nutrient content of the feed given is carefully balanced. Feed is given normally once a day, 2 hours before sunset. 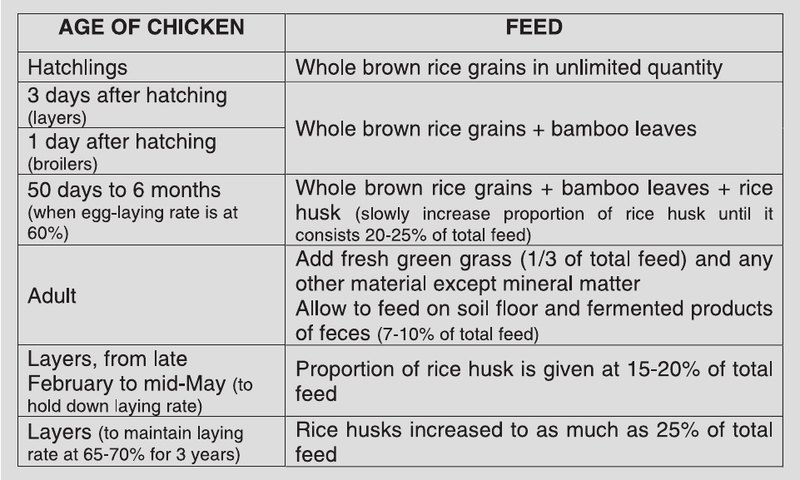 In Natural Farming, newly hatched chicks are fed whole brown rice grains in unlimited quantity instead of enriched commercial feed. After three days for layers and one day for broilers, bamboo leaves are added. On Day 50, rice husk is added. Gradually, the proportion of rice husk is increased until it consists 20-25% of the total feed at 6 months, when the egg laying rate is 60%. This kind of feed toughens the intestines and makes the chicken healthy. Conventional farming believes that soft powder should be given to chicks, which have fragile stomachs. However, giving soft and over-nutritious feed will prevent chicks from developing strong digestive organs. This leads to the excretion of undigested nutrition, which causes smell and disease. Any material except mineral matter can be given as feed. Fresh green grass is good and it makes up for 1/3 of the total feed for adult chickens. Feed can be found on the housing floors, too. Along with soil rich in microorganisms, the fermented products of chicken feces can make up for 7-10% of the total feed. To hold down the laying rate, rice husks can be used at 15-20% of feed from late February to mid-May. To maintain the laying rate at 65-70% for three years, rice husks can make up as much as 25% of the total feed.